The Marine Corps has three different types of uniforms -- "field," "dress," and "service" (see link above for official regulations). The service uniforms include Alphas, Bravos and Charlies. The dress blues uniforms include Alphas, Bravos, Charlies and Deltas. There are three field uniforms including Combat Utility, Flight Suit and Mountain Warfare. The most common is the Combat Utility, also known as MCCUU (Marine Corps Combat Utility Uniform) but it most commonly refered to as the "Utilities" or "Cammies". They are available for different uses in Forest Green and Desert Sand. The new "cammies" have a digital camouflage pattern suitable for "every clime and place". We've included a chart below for your reference. Note: "A" is also known as Alphas, "B" as Bravos, "C" as Charlies, and "D" as Deltas. Image info: Retired Sgt. 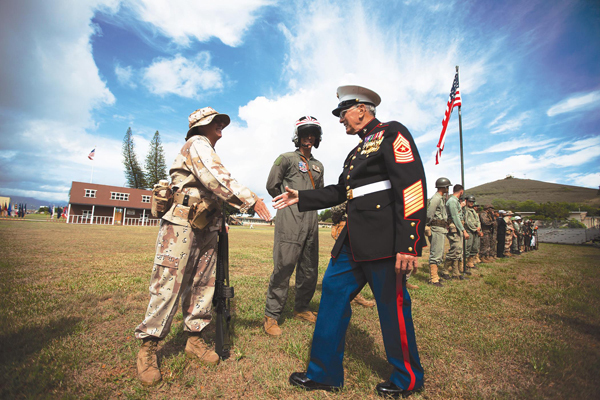 Maj. James Snyder, an 82-year-old veteran of the Korean War and Vietnam, who served for 28 years, and a native of Dayton, Ohio, shakes hands with Marines dressed in uniforms from periods throughout Marine Corps history during the 2013 Marine Corps Base Hawaii birthday pageant at Dewey Square, Nov. 8, 2013. Each costume is a replica of a uniform worn during different historical eras, from the Revolutionary War high collar, or "Leatherneck," to the current camouflage utilities. Each uniform highlights the evolution of the Marine Corps from past to present, while also showing Marines still carry the same values and traditions today as when the Corps was established in 1775. The Marine class "A" service coat is olive green (as opposed to forest green for the Army) and has a waist-belt. The Marine service uniform is worn with either a barracks cover, which has a bill and a round top, or a garrison cover, which comes to a peak. Marines are less generous with awards and unit identification. For example, with the exception of breast insignia denoting a few specialized qualifications such as airborne (parachute), pilot or scuba qualification, or red patches sewn on the trouser legs and covers of some logistics Marines, Marines do not normally wear any insignia or device on their utility uniforms denoting their unit, MOS (military occupational specialty), or training. The hat (cover) of the utility uniform is constructed differently. Marine hats have eight sides and corners (hence the name "eight-point cover"). Marines "blouse" their boots. That is, they roll the cuffs of their trousers back inside and tighten them over the boots with a cord. Soldiers either blouse their boots or tuck their trousers directly into their boots. 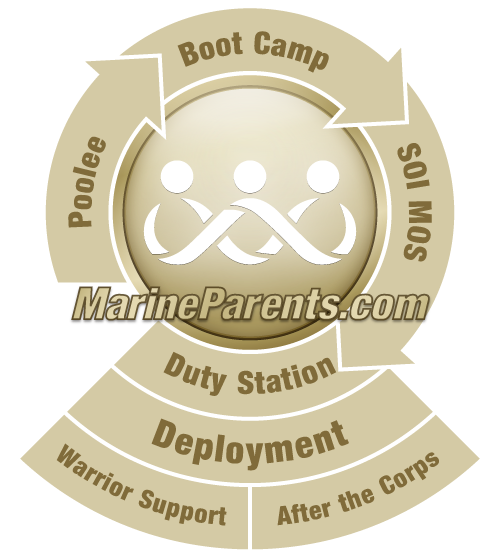 Marines do not wear any rank insignia or other device on the utility cover. The front of the cover has instead the Marine Corps Eagle, Globe and Anchor emblem. On their utility uniforms, Marine officers typically wear their rank insignia on both collars, while Army officers typically wear insignia on one collar and an insignia identifying their specific "combat arm" (i.e. infantry, artillery, armor) on the other. In a garrison environment, Marine officer's insignia is usually shiny metal, and is affixed in a manner similar to a pin, while Army officers usually wear a subdued stiched on insignia. Marines used to wear black combat boots with the utility uniform, as do the Army and Air Force. But in 2002, light-brown combat boots were introduced along with a new type of camouflage, the "MARPAT" uniform. Effective 1 October 2004, black combat boots were declared obsolete and no longer authorized for general wear by Marines. Exception is made for black safety boots worn for certain tasks, such as parachuting. As of 1 October 2006, the old-style camouflage utility uniform, also worn by the Army and Air Force, will be declared obsolete. The only utility uniform authorized for Marines be the MARPAT uniform.